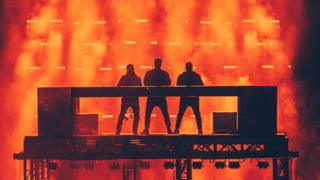 Swedish House Mafia are reuniting for a show in their home city of Stockholm in Sweden - five years after their split. A week-long countdown clock hyped the announcement in which they also said they'd be touring with new music. Rumours of a reunion began after they made a surprise appearance at Miami's Ultra Music Festival in March. Posters of the EDM supergroup, made up of Axwell, Steve Angello an d Sebastian Ingrosso, also popped up around the Swedish capital - leading people to speculate about a comeback. All three DJs spoke entirely in Swedish during the press conference and didn't give any details about where and when they would be touring after the Stockholm gig. They didn't give many clues about what to expect but according to comments under the press conference live stream, they said the response to their Miami reunion gig made them think about a comeback. They won a Grammy in 2012 for Save the World and in 2013 for Don't You Worry Child.